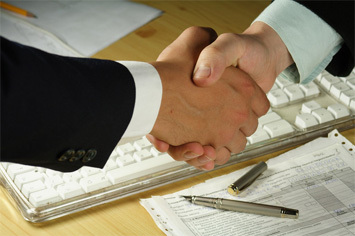 At our firm, we employ a team approach, where we work together toward a common goal. This approach provides the best possible representation for our clients and a pleasant work environment for our employees. We are proud of our team spirit and our professional and motivated employees. We offer a competitive salary, generous benefits which include 401(k) and profit sharing plans, health insurance, life insurance, long-term disability coverage, personal, vacation and sick days, and paid holidays. We recognize the importance of quality of life and we offer an environment which supports our employees’ participation in family and outside activities. The firm also encourages participation in organizations within the community and provides contributions to support organizations as appropriate. The firm currently pays for employee attendance at local conferences and CLE requirements for attorneys. The firm employs a number of individuals in the capacity of professional, support and secretarial staff. We are continually seeking attorneys, paralegals, legal secretaries and other support staff with an interest in our firm. Even during times when positions may not currently be open, we are always willing to receive your resume for consideration for future openings. Or follow THIS LINK to upload your resume and supporting documents. Communicates (both in verbal and written form) with clients, Partners and Associates, Paralegals and other firm staff, vendors and banking contacts. Generates 1099's, W-2's and other tax compliance documents. Perform online banking transactions to include wiring of funds. Open new matter numbers for the firm. Apply payments to client matters. Minimum of 1 year Accounting experience. Preference of Associate Degree in Accounting or Finance. Excellent written and verbal communication skills, including ability to articulate recommendations in concise and timely manner. Strong computer skills in Accounting Software; Quickbooks and Microsoft Excel. Maintains grounds in clean, safe, and orderly manner including mowing, trimming, weeding, aerating, minor pest management, composting and fertilizing lawns; replaces plants as needed; cleans debris from grounds, pathways, and parking lots; maintains grounds maintenance equipment; prunes trees and shrubs. Occasionally fill in for the office courier.